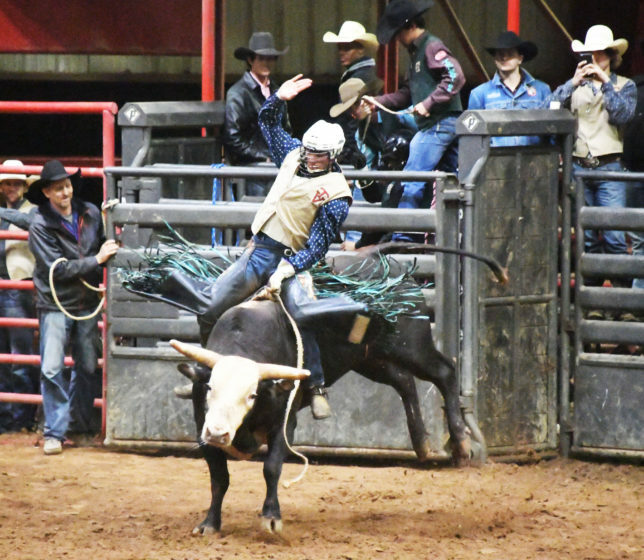 Trinity Valley Community College will host the 11th annual National Intercollegiate Rodeo Association rodeo on Feb. 8 – 9, 2019 at the Henderson County Fair Park Complex. Coming from as far away as Louisiana, the event will feature approximately 400 contestants representing 20 colleges and universities including: Hill College, Southwest Texas Junior College, McNeese State University, Louisiana State University, Trinity Valley Community College, Northeast Texas Community College, Lone Star Community College – Montgomery, Panola Junior College, Texas A&M University, Sam Houston State University, Stephen F. Austin State University, Texas A&M University – Kingsville, and Wharton County Junior College. Each NIRA member college has its own club composed of student members and sponsored by a faculty advisor who supervises the club’s activities. Each year, a men’s team consisting of 6 members and a 4-member women’s team is chosen from each school. These team members travel to the regional rodeos competing against other NIRA member schools. Those not chosen for the team may compete on an individual basis and still be eligible for all prizes except those given to the team. The top three contestants in each event from each of the NIRA’s 11 regions qualify to compete in the CNFR. The top two men’s teams and women’s teams also qualify from the regions. Several local hotels are offering competitive rates for rodeo competitors and families. Please contact the Holiday Inn Express, Best Western Royal Mountain Inn, and Super 8 to learn more. Don’t forget to mention that you’re with the TVCC Rodeo event to receive these special rates. The sponsors who make this possible are: Living For The Brand Cowboy Church, Henderson County Farm Bureau, Athens Bank, Kevin Lilly’s McDonalds, Citizens National Bank, Best Western Plus, Holiday Inn Express, Super 8, UT Health East Texas EMS, Mark Roberts D.D.S., Miars Enterprises LP, Southside Feed, Reynolds New York Store, Mills Feed, Cole Air Conditioning Company, Phoenix Landscape Services, Punchy Pony, First State Bank, Ag Power Inc., KCKL, Whataburger, Texas Farm Credit, Hannigan Smith Funeral Home, Citizens State Bank, Champion Genetics, TVEC, Heritage Land Bank, TSC, Wal-Mart, Athens Cleaners and Laundry, Prosperity Bank, Henderson County Veterinary Clinic, Superior Hay Farms, Smith Lumber, Boot Barn, Athens Tractor and Equipment, Athens Equine, Aguilera Land Clearing and Equipment Rental, Spencer Hardware, East Texas Ag Supply, Hannigan-Smith Funeral Home, Four-T Saddles and Tack, Steve Grant Real Estate, All Around Storage, and Morton Small Animal Clinic.